Some people don’t seem to understand that there can be microbial harmony and human health, when there is abundant diverse species microbes in the gut lining to counter pathogens that may be present in the terrain. The problem starts when there is not sufficient beneficial microbes, in the diet or gut lining, and the potentially harmful ones take over. When sources of beneficial diverse species microbes are demonised and removed from the human diet we are in trouble… Research now show commercial probiotics are not a quick fix and can be harmful. How can Australians access good bugs for good health with all this confusion? What is an open secret? It is a concept or idea that may be known in certain circles but not generally acknowledged. It can be something that is known to be true but which none of the people most intimately concerned are wiling to categorically acknowledge in public. As long as an issue is shrouded in enigma it guarantees that people will be unable to understand it or act on it. It will remain a mystery. Some open secrets are controversial and that prevents open conversation. Those who know a certain truth may fear upsetting the status quo. They know revelation may cause others to come to some shocking conclusions that may cause all to re-evaluate their beliefs. Sometimes people believe so strongly in the integrity of an ideology that to suddenly realise that their assumptions and assertions were flawed, can alter their perceptions irrevocably. It can be an unpredictable process when circumstances cause these so called 'open secrets' to be seen by all. authority was making it harder for cheesemakers to produce the cheeses people wanted to buy and it was harming small businesses. According to a September 2017 article by journalist Joanna Blythman, the US FDA was so convinced that raw milk cheese was a likely cause of food poisoning that in 2016 it tested over 1,600 samples - only to find that the total burden of pathogens was less than 1%. She says this makes it safer than many of the foods we eat on a daily basis. 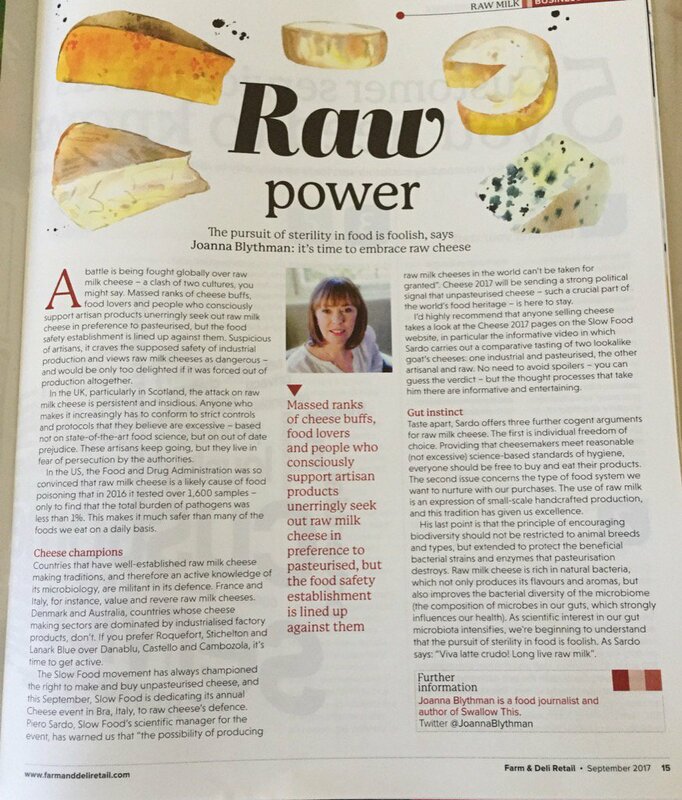 In the same article she mentions the work of the Slow Food Movement, in particular Piero Sardo who argues that cheesemakers should meet reasonable (not excessive) science-based standards of hygiene enabling everyone to be free to buy and eat their products. What is in the open today but still not generally acknowledged in the media around microbes? "Most E. coli are harmless and actually are an important part of a healthy human intestinal tract..."
This is written on the CDC website, yet most people seem to know nothing about it. It may be because for many decades we have been hearing about the potential danger of bacteria. Or perhaps it is because the full story was and still is not being told by our media. The following quote is from a report telling the larger story of E.coli: its role in human health, in food, and even in our understanding of our own biology. This was written by an expert panel of microbiologists, food safety experts, and bacteriologists to develop a more accurate picture of this often maligned bacterium. "Most E.coli are not harmful to humans, and some are even beneficial. Many of us host a population of E.coli in our gut that aids digestion and protects us from other harmful microbes." "Listeria is a family of bacteria that is common in our environment and usually harmless." This quote is from a Canadian patient education fact sheet. The fact sheet explains that one particular harmful strain can lead to very serious illness in people with weak immune systems and explains what type of foods can potentially contain it. "Listeria monocytogenes is one strain of the Listeria family that can cause harm. The illness is called Listeriosis." Another article say: "Listeria monocytogenes is harmless to most people, even when ingested at high levels. Many of us will have the bacteria in our guts at some time and they usually pass through without harming us. People at high risk are those with reduced immune function..."
If most E.coli strains are "not typically harmful to humans" and many harmless Listeria species exist, and beneficial microbes equals good health and some degree of immunity, where does that leave us? Image: What is potentially misleading in this image? Click to enlarge. Cheesemakers now reveal that some of these harmless E.coli bacteria can be seen as beneficial because they are responsible for the flavour that make raw milk cheeses unique and superior to commercially produced ones. In this scientific article, Melbourne chemical biologist and researcher Dr. Ethan Goddard-Borger talks about what he calls "crucial protective strains of E.coli": "E. coli provides a protective barrier that prevents growth and colonisation by bad bacteria, because the good bugs are taking up all the habitable real estate." This scientist clearly knows something that most people do not. "E. coli is a key bacterial coloniser needed by our gut." Research now show how a single strain of E.coli can annihilate Salmonella. "In fact, E. coli reduced salmonella levels by more than a hundred-fold in this study, a promising performance in an area where antibiotics don’t make the grade—their bulldozer approach only makes the infection worse by wiping out good bacteria, too." The article says that the probiotic strain of E.coli Nissle 1917, which helps ease Irritable Bowel Syndrome, is available as an over-the-counter pill in Germany. A number of European studies on E. coli Nissle 1917 have shown positive results when used in conditions such as ulcerative colitis, Crohn’s Disease, chronic constipation, prolonged diarrhea, irritable bowel syndrome and pouchitis (source). Another article describes the probiotic E.coli that assists in treating symptoms of IBS like ulcerative colitis. It refers to studies done that show probiotic E.coli to provide relief from infectious diarrhoea, which is common in infants and children. It normalises bowel function and it has long been used to combat diarrhea. Probiotic E.coli Nissle 1917 has 100 years of medical application behind it and has a fascinating history. "An unfortunate side-effect of many broad spectrum antibiotics is the disruption of this protective layer of microorganism (E.coli). Without that protective layer other harmful organisms can colonise the gut. This is why many people develop diarrhea after taking antibiotics." like B12) that the body cannot produce itself. Some researchers suggest Vitamin K2 is the mystery nutrient discovered by dentist Dr. Weston A. Price; referred to as Activator X. Vitamin K2 play a central role in calcium metabolism, bone mineralisation etc. In this video Dr. Natasha Campbell-McBride explains that beneficial E.coli are part of the bacteria that break down lactase. Another little known fact about E.coli is that it has contributed to 12 Nobel prizes. The Nobel Prize is science's highest honor given for discoveries that "have conferred the greatest benefit to mankind." Escherichia coli got its name from its discoverer, Theodor Escherich, and because it grows in the colon (coli) of humans and animals. E.coli is possibly the most studied bacterial family in the world. According to a teaching poster by the American Society of Microbiology the average human body is made up of 100 trillion cells. 90 Trillion are E.coli and other microbes. Only 10 trillion are human cells. That means that we are really only 10% human. It also implies that bacteria are 90% part of the homo sapiens experience. It is our very nature. Image: According to Mark McAfee, we are bacterio sapiens instead of homo sapiens and raw milk is a gut biome builder. The E.coli family in particular deserve some credit. It is not fair to demonise an entire family of mostly harmless microbes when only a "tiny minority" are bad apples. It is now clear that harmless bacteria have been targeted, demonised and discredited often, whether intentional or not. It is also clear that any campaign working against beneficial bacteria is also a campaign against the well-being of mankind, whether intentional or not. If a news article say that E.coli or Listeria were found in a particular food like raw milk, what does that mean? People who know that harmless E.coli and harmless Listeria exist may question such a statement. It is likely that they may ask if the milk was contaminated with harmful bacteria or not? If an article does not specify, what does that mean? Can it imply that only harmless bacteria were found? What is the likely response of someone who do not know about the difference? Based on what they have been taught, their own ignorance, their fear of questioning authority or perhaps their own belief in the credibility of the source; may cause them to believe what they are presented with. It is likely that they may conclude that bad bacteria were found and consider it a contamination statement. many know the specific names of the four most common pathogens responsible for food-borne illness? This lack of ability to discern is common when people read articles about raw, unpasteurised milk published in mainstream media. There is sometimes an innuendo that all E.coli or Listeria are bad. Or perhaps it is just a lack of clarification? Or is it purposefully misleading? The choice of words and a variety of obstacles often ensure that people are just not able to come to a proper understanding of a situation. They are often left to assume the worst. This is because most people just don't know the truth, don't understand the details and don't know how to navigate them. Video: "How Raw Milk Builds a Strong Immune System"
Some articles that appear in the media about raw milk describe it in a derogatory tone. They say that raw milk may potentially contain E.coli, Listeria, bacteria, viruses or parasites, as if all of these are bad. According to research bacteria, viruses, protozoa, small worms and fungi make up the human microbiome anyway. New North Queensland research show hookworm is harmless and beneficial for humans. According to this article there are other worms which have been found might also assist in the treatment of diseases like coeliac. Harmless E.coli and harmless Listeria also are a natural part of the human gut whether they just move through or live there permanently. To people who know about the existence of these harmless and beneficial bacteria it is clear that the full story are not being told. The media may be publishing many articles about the latest science but they are not connecting the dots and telling the full story involving raw milk. For example: Clostridium difficile is a spore forming bacteria that can result in serious diarrhea and inflammation when good gut bacteria are disrupted. The media typically call it either by its full name or the abbreviation C.diff. The name is often correctly associated with and identified as harmful. According to latest research another bacterium of the same genus called Clostridium orbiscindens can help prevent the flu. Another probiotic of the same family is Clostridium butyricum. It is clearly possible to make an accurate differentiation. Why do the media still shame raw milk and raw milk cheese for possibly containing "E.coli" without making the proper distinction? They do not acknowledge that there are two kinds of raw milk either. According to Mark McAfee from the Raw Milk Institute, Campylobacter was not considered a human pathogen in America until 1972. It was considered normal to have Campylobacter immunity once you've had it. He says we must have this bio-diversity in our gut, because if not, it is like having the welcome mat out for pathogens. The real health crisis started when people lost their gut bio-diversity and as a result, their immunity. Health issues are now strongly linked to the overgrowth of potentially dangerous bacteria, whether that bacteria was introduced or normally co-existing within us. Resident bacteria aren't usually a problem because the abundance of beneficial flora and a healthy immune system keep the balance. However with the over-use of anti-biotics and junk food this balance have been disturbed, allowing bad bacteria to take over. Scientists have now put the puzzle together. They show how humans became immune compromised in the first place. They also show how we can fix it by restoring an abundance and bio-diversity of good bacteria and giving them more dietary fibre to thrive on. Read more here: Gut Microbiota and the Immune Compromised and Gut Rehab. We cannot stop certain bacteria from producing toxins in the digestive system. Even normal, harmless E.coli can produce toxins under the right conditions. However keeping a healthy variety of microbes in the gut can prevent those bugs from living long enough to reproduce and make a person sick. Video: "Pasteurization: Good for Shelf Life not Gut Life"
This article is not about downplaying the dangers of pathogenic bacteria or anti-biotic resistant strains. It does not deny that virulent pathogens can cause severe illness or death. The information in this article is about increasing ability to discern between what is harmless, what is real scientific risk, how to mitigate risk and how to increase immunity. The level of risk is clearly an important factor. The risk for a healthy person is going to be very different to the risk for the immune compromised or for young people with a developing immune system. No food can be produced to be 100% safe. All food carries some risk. That risk can be mitigated by a installing a regulated raw milk industry, which is why ARMM advocates for it. Nobody can guarantee the safety of raw milk, but when it is produced to high standards, raw milk can create a stronger immune system in healthy individuals. Today we still have the compulsory testing for harmless E.coli bacteria in raw milk cheeses in many countries, including Australia and New Zealand. It is severely hindering small-scale cottage food industries from taking off. According to this article the generic E.coli family has traditionally been used as a microbial indicator for the lack of adequate sanitation during processing. Some scientists still seem to assume that if these harmless organisms are in there, then more sinister pathogens are also lurking in the food (more). They consider these tests for non-toxigenic E.coli their "canary in the coal mine", an indication of a dairy that isn't sufficiently clean. Catherine Donnelly, a professor of food science at the University of Vermont and an expert on the microbiological safety of food calls this testing: "a meaningless microbiological standard" (source). Cornell University published this paper: "We evaluated the cheese available on the market in New York State for the presence of coliforms and key pathogens liked to dairy products, and we concluded that coliform testing should no longer be used to assess the safety of cheese." Remember that the FDA has paused the use of this testing, but Australia and New Zealand continue to burden raw cheesemakers with it. An Advisory Committee on the Microbiological Safety of Food from the UK concluded in this assessment in point 45 and 46: "Overall, these surveys have not identified any correlations between pathogens and hygiene indicators, while the recent surveys strongly suggest that microbiological parameters, such as ACCs and coliforms, have poor predictive value in identifying food safety concerns in RDM. 46. In addition, several microbiological surveys undertaken between 1995 and 2017 on RDM and cream did not find any correlations between hygiene indicator results for RDM and the likelihood of pathogens being present. The recent surveys strongly suggest that hygiene indicators such as aerobic colony counts have poor predictive value in identifying food safety concerns in RDM." A Melbourne researcher confirms that beneficial E.coli in the gut crowd out pathogenic E.coli and even Salmonella. This has far reaching consequences. In this article Dr. Goddard-Borger say: "It's bums on seats basically." "The good bacteria fills the auditorium so none of the bad eggs can get a foothold." It means that the more good gut bacteria, the less room there is to accommodate bad gut bacteria. It implies we will be healthier and enjoy stronger immune systems. What is keeping scientists in Australia from examining the difference between raw milk for human consumption produced according to world best practise (especially the practises suggested by the Raw Milk Institute that focus on risk identification and risk reduction) and raw milk from a typical industrial dairy? Are they afraid of examining the latest science or talking about 'the open secret'? Are they afraid of possible punitive measures from Australian authorities? Also see the Documentation category of ARMM's Risk identification and Risk Reduction Program, to learn why three different dairy industries view coliforms in a different light. Overseas regulated raw milk examples show that proper systems can enable dairy farmers to produce pathogen-free raw milk that also contain beneficial bacteria that promote health (example). Raw dairy farmers are known to farm for unique, beneficial microbes on their farms. Make it happen Australia. Do the sensible thing and regulate raw milk for human consumption. If rules are done fairly it will enable local economic growth and many other benefits. Put the culture back into agriculture. Image: This picture offers a clearer view on the role of E.coli in the gut, click to enlarge. "There is no guarantee on raw milk safety. Remember last year we had 34 people in the U.S die from cantaloupe. Who would have thought that? So, all there is, is a guarantee that we can give; if you drink raw milk you will have a stronger immune system. And if some bad bug does come your way, from spinach, cantaloupe or whatever, your odds of surviving that encounter are much improved because you have an immune system that's working. You can fight the bad bacteria." Mark McAfee 2013 (source). BBC: E. coli: Are the bacteria friend or foe?